Is your little precious turning one? Here we present to you a collection of beautiful themes for the celebrations! 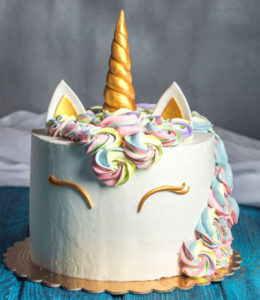 The unicorn theme makes a pretty party with its swirls and colourful rainbows! Dress up white balloons and paper lanterns as unicorns by sticking a paper horn to them. Glue pink ears, pretty eyelashes and some flowers to the balloons/lanterns to complete the look! You can make magical rustling garlands by tying up a bunch of colourful tissue paper strips together. For masks, check online free printable unicorn masks to make them from scratch! To make a unicorn headband for your little girl, take a paper cone for the horn and make a swirl on it with thin gold washi tape. Glue the cone to the headband and add foam ears and artificial flowers to turn your little baby into a unicorn! Include some dream catchers and a big unicorn photo frame in the party to complete the prep! Is your tiny tot a spring baby? Make nature’s beautiful look of the season the highlight of your party! Grab a fine picnic spot for the garden themed party. Serve all the fruits and snacks flower shaped. Gardens have lots of butterflies and bees, so bring in the butterfly cookies and garlands! You can make mushrooms with upside down strawberries stuck up on lollipop sticks. Caterpillars can be green grapes pushed into skewer sticks. Cut a watermelon in half; mount the flower shaped fruit bits on it with a toothpick to make a garden centrepiece! Decorate paper lanterns with twigs, leaves and sparrows for a garden-y feel indoors! Also, use green grass patches as place holders for a lively garden effect! A party filled with their favourite characters would be so much fun for the tiny tots. This theme is very flexible and is suitable for both small and large parties. Have fun! What one year old doesn’t look good in a tutu? Imagine a bunch of tiny tots rocking the fluffy skirts! This is the elegant ballerina theme, overflowing with pastel shades. Tie up soft lights to build up the décor. You can make ballerina shoe cookies, and ballerina stencilled goody bags. To dress up a round table as a ballerina, tape strips of pink tulle around a round table to make the ballerina’s skirt. Place a waist length silhouette of a ballerina in the centre of the table to complete the look. You can also decorate the cake stand the same way with a smaller pedestal. Push pink cupcake liners upside down under lollipops to make ballerina pops. To make ballerina balloons, pleat tulle and tie it up with a big bow under the balloon! You can also get ballerina garland templates online if you want to make them! Choose a soft pink dress for your little cherub to complete the look! The rainbow is a delightful theme for little girls. The electrifying mix of bright colours would bring your little sunshine the biggest joy! To begin decorating, pick everything rainbow coloured. 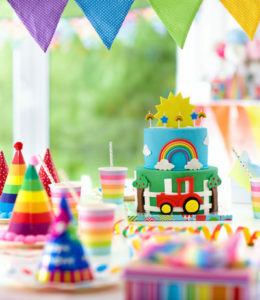 The balloons, jellies, cupcake, frosting, jelly beans, cards, bags, streamers, paper cups, toys – make them all colourful! You can include activities like making bracelets out of rainbow coloured cheerios, or playing skip on a rainbow coloured hopscotch mat. Dress your baby in vibrant colours too, to complete the party! Paint the town red on your little one’s birthday by inviting all the Disney Princesses! Let all the little girls be their favourite princesses for the Party! Tiaras and bustling gowns are a must. You can make the birthday banner with paper cut outfits of different princesses! You can place red roses inside glass tumblers to signify beauty and the beast, clam cream biscuits for Arielle, peeled oranges with green paper stalks as Cinderella’s pumpkins, add a wishing well from Snow White and even some toy dwarfs! Make the photo booths fun with princess hair props! If your little girl knows all the names of the little critters, make her fascination her first birthday theme! Bugs can be as adorable as you want them to be! Make the birthday banner out of a huge caterpillar. Make ladybug cookies. Build Popsicle stick fences and perch some cute dragonflies on top of them. Give lollipops wings and make them butterflies. You can also slice bananas to make delicious worms. Place a round slice of apple or orange on a stick shaped carrot to make snails. You can make spiders out of Oreos by sticking out eight sticks for legs. Include lots of flowers, some gummy worms and pinwheels for this fun party! Celebrate the big day of your little angel with a fairy theme! Mix all things pink, gold, silver and add a touch of sparkle to bring the fairy theme to life! Dip marshmallows in edible glitter to make fairy pops. Pack some glittery fairy dust in small glass vials with cork stoppers to make cute fairy dust. Make a crown for your little girl with mosses and flowers. To prepare mushrooms, add red frosting to cupcakes and embed some gems candies on it. Make wands with a glittery star and some shiny ribbons. Decorate with many soft lights and grab a pair of soft glittery wings for your little baby! Woo-hoo! What child doesn’t love candies? And what fun are parties if you can’t stuff your face with sweets? Constructing your own magical candy land is fun! Make huge candies out of balloons wrapped in shiny paper! Paint paper plates with red and white swirls and wrap them in clear covers to make lollipops! You can also make candies with tulle stuck on the sides of paper lanterns. Coiled pool noodles also make good giant lollipops. Sprinkle generous amounts of confetti on the cupcakes and cookies for the colourful candy effect. Set up a gumball machine and maybe a candy cart too. Load up with delicious candies and enjoy! Sandy, fishy things are fun! Make a big arch with beach balls to welcome the tiny tots. Order a beautiful sandcastle cake for the centrepiece. You can serve seashell-shaped pasta with tiny paper umbrellas. Kids can dig for sunken treasure in sand pits. 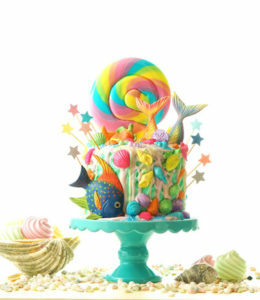 Pack little fishes on top of cupcakes for the beach vibes. You can also spread tiny mats on puddings and put up a paper umbrella for snacks. Make watermelon popsicles by simply thrusting popsicle sticks into the rinds of triangle watermelon pieces. Make some flip flop cookies as well. Enjoy this party indoors or outdoors with fun! 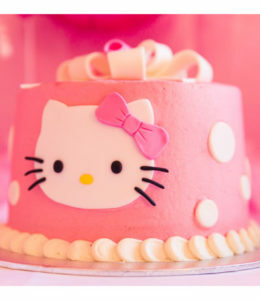 Want a unique theme for your little girl’s birthday? Go Peacock! The magical colours and the intricate pattern of a peacock feather would make the day fantastic! It is very important you choose the right shades to bring this theme to life! Teal, violet, gold and turquoise are the best choices. Choose peacock toned balloons, garlands, tulle, buntings, paper lanterns, tissue pom poms and streamers. You can make placemats out of real peacock feathers and use it extensively in decorating. If you would like, ask all the tiny tots to wear peacock blue shades for a brilliant party! 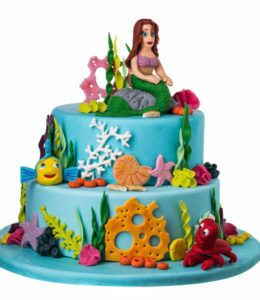 Mermaid is one of the loveliest first birthday themes! It has little fishes, lots of ocean blue and breathtaking shimmer, which makes it awesome! You can make mermaid scales using painted paper plates. Use transparent balloons as underwater bubbles. Stick green ribbons and streamers low on the walls, touching the floor, to make up sea plants. Turn normal goodie cones into mermaids with a glitter tail stuck to the end. You can also give wine glasses tail fins and use them for juices. Make clams out of cookies and cream. Serve starfish and sea horse cookies. Dress up your little bun in sparkly seashell headbands with a shiny dress, and you’re ready! Looking for an elegant party theme for the little lady? Go Pink and Gold. Tastefully build the theme up with carefully picked tiny accents of pink and gold. Throw some gold glitter chunks inside transparent balloons for the sparkle. Serve pastel pink cupcakes, macaroons and candies! Use big bows on the chairs and curtains. Use intricate gold frames to display your baby’s one-year journey. You can use glitter dipped mason jars to hold cutlery and pink flowers. Glam your little doll for the day in pink and enjoy! Every girl is the Princess of her folks, and your little button is no different! Celebrate her big first birthday with pomp and grandeur with a Princess themed party! Pick an elegant birthday banner, a shining crown for your baby, and dress up a pink paper lantern in gold crowns for the décor, and you’re ready to go! Make castles and crowns everywhere – with balloons, cupcakes, even sandwiches. Don’t forget a royal throne for the little lady! Check out our first birthday themes for boys for more exciting first birthday themes!